Zack Snyder’s Batman V Superman: Dawn of Justice has officially hit theaters, and has driven comic book fans wild. 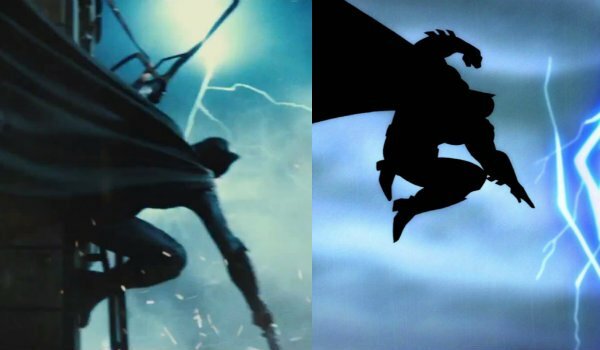 For the first time ever, the Dark Knight and the Man of Steel have faced off on the silver screen, in one of the coolest cinematic showdowns ever committed to film. If nothing else, Dawn of Justice has proven that Zack Snyder knows his stuff, and has no trouble adapting comic books source material to the big screen. "My parents taught me a different lesson..."
Chris Terrio wrote a top notch script when he penned Batman V Superman: Dawn of Justice, but he made sure to throw in some of Miller’s best lines for all of us fans, as well. He adapted numerous quotes from various iconic DC stories, but one of the best moments comes towards the end of the titular battle, when Batfleck utters the iconic speech: "My parents taught me a different lesson... lying on this street... shaking in deep shock... dying for no reason at all. They showed me that the world only makes sense when you force it to." It’s heartbreaking, and completely encapsulates the psychology of this version of Batman. He’s been hurt before, and he’ll never let himself be hurt again. We’re not going to lie, we completely geeked out when Zack Snyder included this moment in Batman V Superman: Dawn of Justice. During his battle with Doomsday, Kal-El takes the Kryptonian beast into space, and holds him while the United States government strikes them both with a nuclear warhead. The blast doesn’t kill either of them, but it severely weakens Superman for a brief period of time. 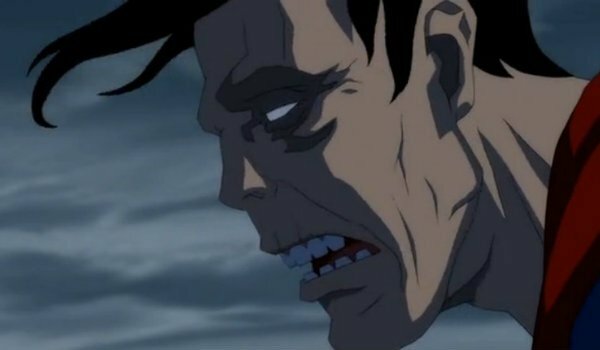 Following the detonation, the last son of Krypton looks incredibly emaciated, and almost like a zombie, and then slowly heals as he takes in sunlight – similar to how he looked when he stopped a nuclear blast over Corto Maltese during the events of The Dark Knight Returns. One of the most utterly badass references to The Dark Knight Returns comes when Bruce Wayne saves Martha Kent from Lex Luthor’s henchmen. After completely decimating a room full of men, KGBeast and another thug cover the only door into the room. Instead of bursting through the door, Batman punches his way through the wall and grabs the thug’s M-60 machine gun – which he uses to shoot KGBeast’s flamethrower and save Ma Kent. 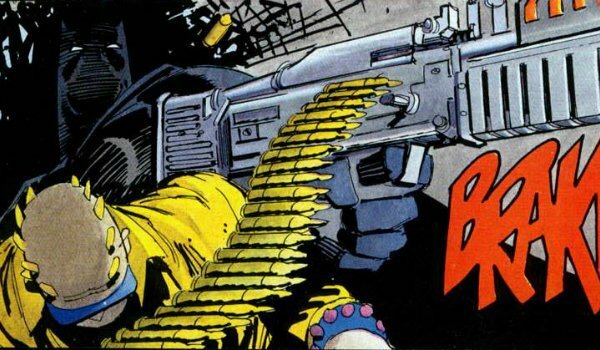 This moment is almost directly lifted from a sequence in The Dark Knight Returns, where Batman pulls the same move on several members of the Mutant gang in order to save a kidnapped child; Snyder even got the type of machine gun right. We aren’t going to deny that Batman V Superman: Dawn of Justice ends on a low-note for our heroes. The Man of Steel falls, and those close to him attend his funeral in Smallville, Kansas. 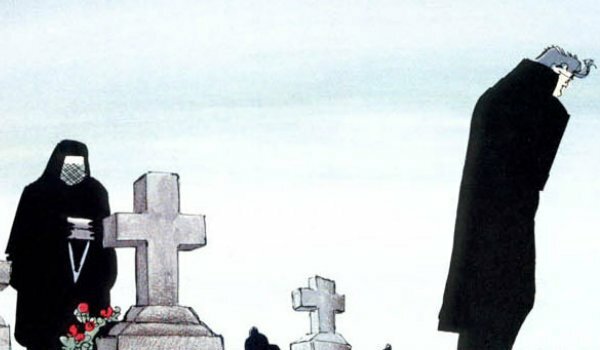 However, there’s a brief moment towards the end of the sequence that sees Lois Lane standing alone by his graveside. As she drops dirt onto Clark’s coffin, a faint heartbeat can be heard. While this obviously indicates Superman’s imminent resurrection, it also seems like a reference to the end of The Dark Knight Returns, when Superman himself hears Bruce’s heartbeat from inside his coffin after the Caped Crusader faked his death to escape the government. When Batman decides he is going to steal a large chunk of Kryptonite from Lex Luthor in order to combat the Man of Steel, he tracks the shipment from a dock by placing a homing beacon on a truck. The sequence begins with him standing on a crane holding a sniper rifle. 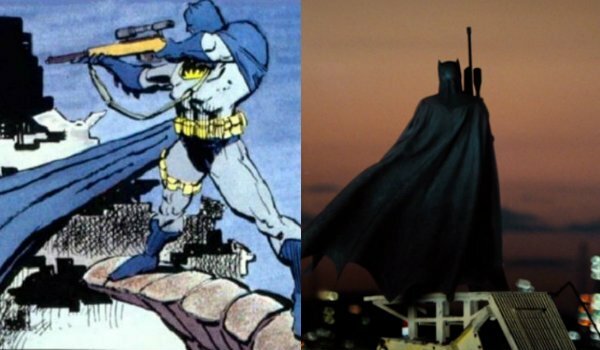 As Batman will never use a firearm to kill, the imagery represents a clear homage to The Dark Knight Returns, where he similarly used a scoped rifle to fire a grappling gun between two towers during a battle with Harvey Dent a.k.a Two Face. 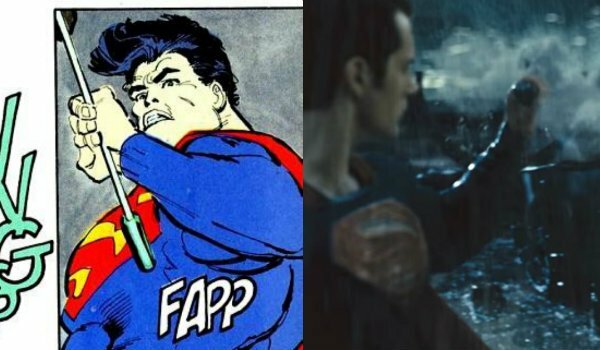 Snyder ultimately changed the purpose of the gun in Batman V Superman, but the visual similarities cannot be denied. We’ve got to hand it to Zack Snyder. 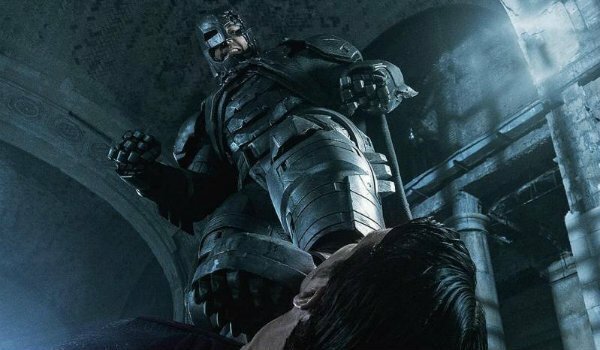 Although the fight between The Dark Knight and the Man of Steel isn’t very lengthy in Batman V Superman: Dawn of Justice, he managed to make it about as badass as it could possibly be. Part of the reason we love this fight so much is the way in which Snyder directly used tactics used by Batman in the original fight, and adapted them for the silver screen. From the power armor, to the use of sonic guns, booby traps, and even a cloud of kryptonite gas, Snyder did his homework on how Miller’s Batman took down the last son of Krypton. It’s a fairly well established nerd fact that almost all iterations of Batman don’t drink alcohol. 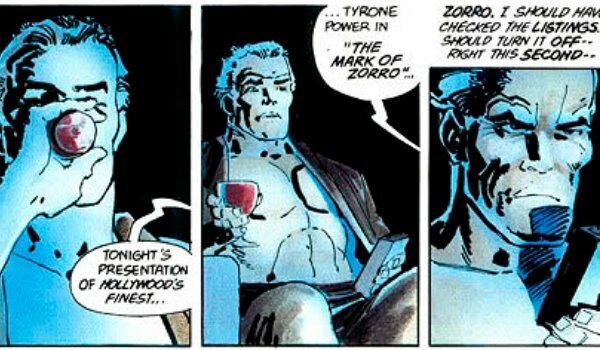 One of the most notable exceptions came in the form of the aging Bruce Wayne from Frank Miller’s The Dark Knight Returns. Having experienced a long career full of death, loss, and darkness, both Miller and Snyder’s versions of Batman have looked to the bottle as a means of coping with the evil and chaos that has enveloped them. It’s an incredibly minor detail, but one that die-hard fans of the character most surely picked up on when they saw Dawn of Justice for the first time. It’s an element from the film that’s never fully explained, but also needs no explanation for die-hard comic fans. Bruce Wayne keeps the uniform of a dead Robin on display in the Batcave as a means of reminding himself of the friends he has lost, as well as the reasons he does what he does. Robin’s uniform on display in the Batcave has become so ingrained in our minds, that many of us likely don’t even know that The Dark Knight Returns was where the idea originated – several years before A Death in the Family ever eve hit shelves. 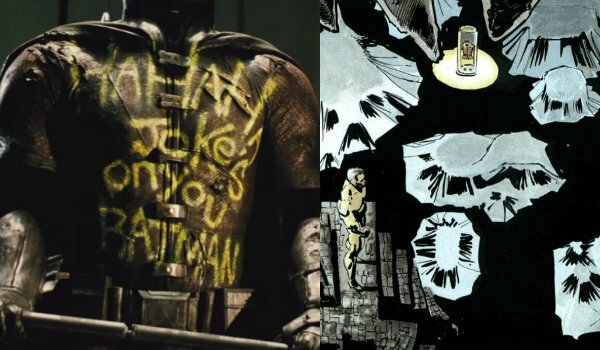 Like Batman V Superman: Dawn of Justice, The Dark Knight Returns provided very little details into the demise of Jason Todd, instead opting to just let audiences see what the death had done to the psyche of Bruce Wayne. This is one of those "blink and you’ll miss it" references, but that doesn’t make it any less awesome. There’s a brief moment during the climactic battle with Doomsday where Batman quickly uses his grappling gun to escape the giant beast. As he latches onto a building and fires off a second grappling hook, a bolt of lightning strikes behind him. The pose he makes during that quick moment perfectly mirrors that now iconic cover image from The Dark Knight Returns, and has become one of the most beloved images of the modern Caped Crusader in the years since the book’s release. 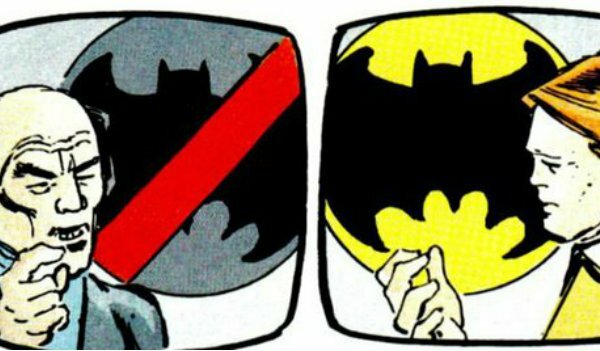 One of the most unique aspects of Frank Miller’s The Dark Knight Returns is the way in which the writer uses news media to inform how different segments of the Gotham City population feels about the return of Batman to his crime fighting ways. Zack Snyder employs a similar tactic in Batman V Superman: Dawn of Justice at one point by featuring a lengthy montage of various notable figures – including Neil DeGrasse Tyson and Holly Hunter’s Senator Finch – discussing the role metahumans play in our society, and whether or not someone like Superman is the hero this planet really needs.